Altmetric it is a bookmarklet you install in your browser. Once installed go to any recent publication on the journal web page and click on the bookmarklet to get altmetric data (once you have installed it try this computational chemistry paper as an example). Most importantly you get links to twitter comments and blog posts (I hear Google+ and PubPeer integration is on the way) where a lot of post-publication peer review happens. I think this is the future of post-publication peer review: don't worry about where it happens, just make sure it can be easily found. PubPeer is discussion forum centered around journal articles and preprints (click here for a computational chemistry example). These discussion fora are notoriously difficult to get off the ground so I am impressed how much discussion is already going on there. PubPeer has recently made an extension that adds links to PubPeer comments on Pubmed search results and journal websites. PeerLibrary allows you to create and share annotated versions of papers. If you think about it, the most common form of post-publication peer review is the highlighting of text and margin notes we all make when we read a paper. PeerLibrary allows you to share this. I do most of my annotations using iAnnotate on my iPad and uploading pre-annotated pdf files does not seem to work for all pages, so I am not sure how much I will use this service yet. Also, the text in the uploaded files are currently quite grainy. But I like the general idea very much and I'll probably use it more if/when these things get fixed. Anyway, you can see what I have messed around with so far here. (1) Prepare (e.g. paste in) the review and de-select "Has this article been published?". This will just list the article title and journal. As the site states "We can not publish the content of your review until the article has been published, as this would be unfair to the author if they decided to resubmit the article." (2) Once the article is published, you can make the actual review visible. It would be nice if Publons could keep track of this (using the info you provided) and alert you. You can also review papers already published (in which case it's a bit like PubPeer) and you can also review anonymously. Have I missed some cool reviewing tools? If so, leave a comment. 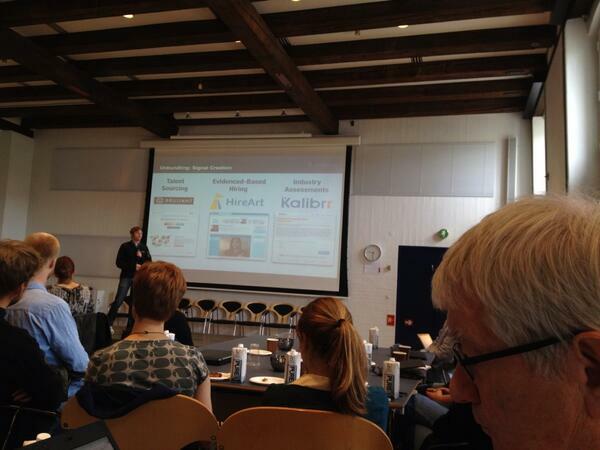 Last Wednesday I attended the morning session of the EduDisrupt meeting in Copenhagen. The talk that interested me most was by venture capitalist Michael Staton, a former history teacher (some things he has written here and here). Towards the end of the talk he flashed up four slides with companies he has invested in and some of them sounded pretty interesting. I managed to take picture of the last 3 so I could look them up later, which is what I am doing now. I am pretty sure Udemy and Edmodo was on it. Can we, teachers or universities, provide similar services or use similar tools to identify, help, retain, and promote students? Our methodology to find in a stochastic way variants for HIV-1 protease is finally published! You can read it and download it through this link. 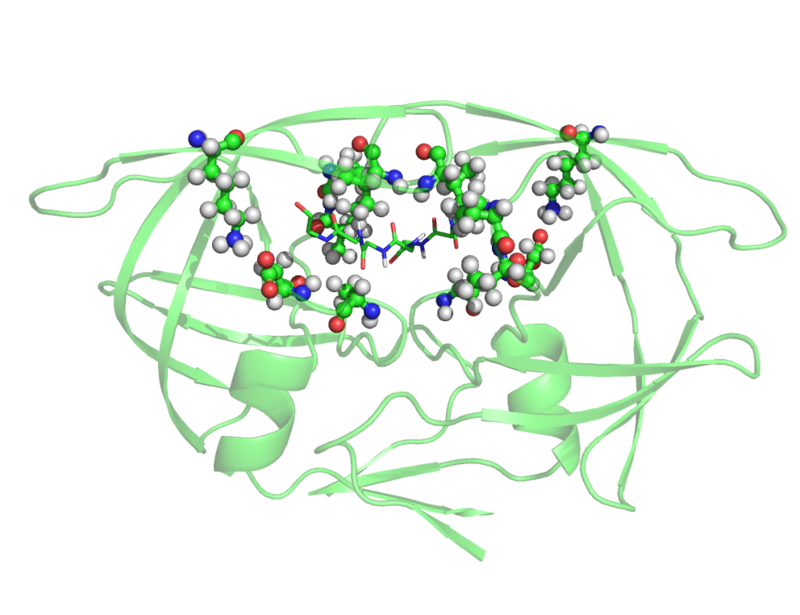 The residues located by our methodology as the most apt to be changed, so as to bind better the new peptide substrate. Check out the paper to learn more. The work behind this paper has been long and painful, but hopefully worth it. But that's no news, most papers are born that way. The algorithm we used is based on PyRosetta, a Python interpreter to Rosetta. Structures were further evaluated with FMO single points at the MP2 level of theory, which accounts for a big part of the spent time.